An estimated 6,000 Jaysh al-Islam militants and their families are expected to withdraw from East Qalamoun, northwest of Syrian capital, to Jarablus in northern Aleppo province. 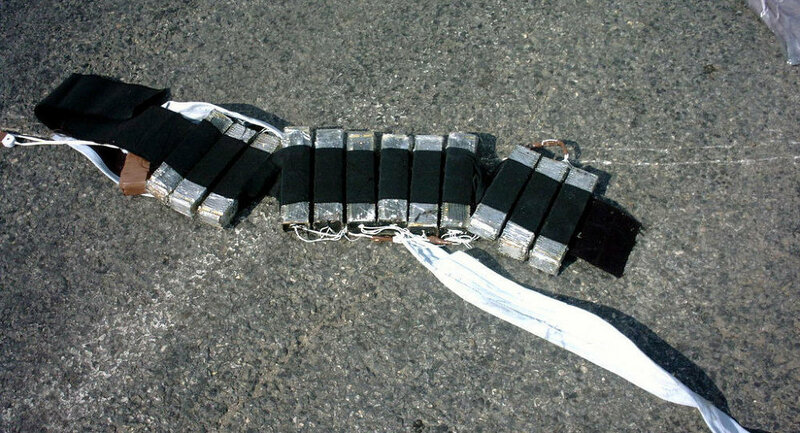 Syrian troops carrying out searches of militants at the settlement of Ar-Ruheiba in the Eastern Qalamoun Mountains in Rif Dimashq Governate have seized suicide belts and ammunition which jihadists tried to take with them during their withdrawal, the Syran Arab News Agency reports. According to the Syrian Army, the militants' withdrawal, agreed based on the same terms allowing fighters to withdraw from Eastern Ghouta, will continue for the next two or three days. Last week militants concluded their withdrawal from the city of Dumayr, the makeshift capital and key supply center for militant positions in Eastern Qalamoun. SANA has published photos of the weaponry surrendered by militants in the region. The weapons includes NATO anti-tank missiles, communications equipment, rocket propelled grenades, heavy machineguns, shoulder-fired MANPADS, truck-mounted heavy cannons, jeeps, trucks and even tanks. — Danny Makki (@Dannymakkisyria) 22 апреля 2018 г. #SAA confiscates #TOW / #LAW / #Grad missiles + launchers, 28+ Tanks, #ZSU-23-4 (#Shilka), BMPs, artilleries, assault rifles, #NATO sniper rifles, mortar launchers, IEDs, #France & #USA communication devices, binoculars, nigh vision goggles & large amount AMMO in East #Qalamoun. — 24 Resistance Axis (@Syria_Hezb_Iran) 22 апреля 2018 г. … remember these "journalists" who basically told you that Syria's "rebels" were poor donwtrodden "revolutionaries" who had to fight with "home made weapons"? — Dominic | دومينيك (@domihol) 22 апреля 2018 г. The Syrian government significantly strengthened its control over the country following the liberation of the major population center of Eastern Ghouta northeast of Damascus earlier this month. In addition to a Daesh (ISIS)* which has been reduced to a few pockets of resistance in eastern Syria, militant opposition is concentrated in the Daara and Quneitra governates in the country's southwest and near the Israeli and Jordanian borders, a pocket northeast of the city of Homs, and territories in the Idlib and Aleppo governates near the Turkish border. Northeastern Syria is controlled by the Kurdish-majority Syrian Democratic Forces and their US allies.